The Falcons' star trio of Matt Ryan, Julio Jones and Calvin Ridley all committed crucial fumbles in the red zone. 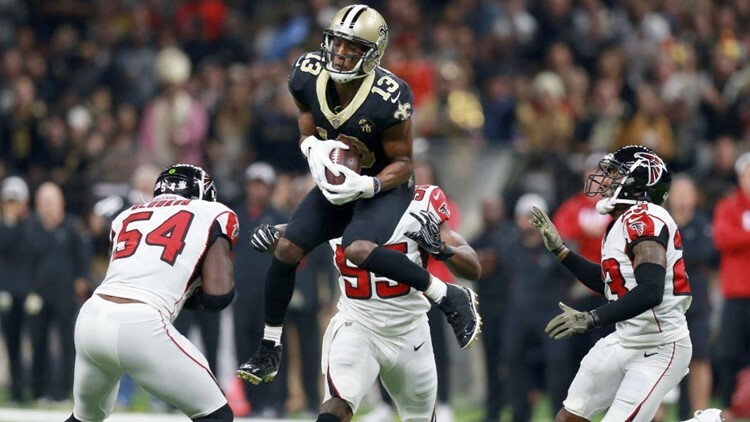 The eternal optimist would point to Atlanta's palatable schedule down the stretch (the five opponents have a combined record of 20-29-1), the imminent return of linebacker Deion Jones and the mediocrity of the NFC's wild-card contenders. The pessimist, in turn, would take the same three arguments from above and have a field day with the flip side. a) The fans in Baltimore, Green Bay, Arizona, Carolina and maybe even Tampa Bay have penciled in their respective teams for wins over a slumping 4-7 squad (Atlanta has dropped three straight). b) Jones' return from injury, while helpful, won't necessarily move the needle on the Falcons consistently holding proficient offenses to 20 points or less. c) The NFC hasn't had a wild-card entrant with nine or fewer wins in a decade (see below Tweet). With all due respect to the 'optimist' crowd, it's becoming increasingly difficult to argue the Falcons as a seven- or eight-win team—let alone a 9-7 team that somehow sneaks into the NFC playoffs (not with a current conference mark of 4-4). Bottom line: The Falcons were never serious contenders for victory on this holiday night. The Saints (10-1, 1st place in NFC South) prevailed in the categorical battles of first downs, yards per play, rushing yards, turnovers and time of possession. The turnovers were especially painful ... and horribly timed. Matt Ryan, Julio Jones and Calvin Ridley all committed crucial fumbles in the red zone, essentially ruining the Falcons' chances of remaining competitive. In fact, it's hard to argue which fumble was the most damning. **Ryan got stripped from a desperate defender on the pass rush. **Jones got spun around like a helicopter on his fumble. **And Ridley was on the path to scoring a touchdown late in the fourth quarter ... before losing control at the Saints' 1-yard line.